Home » Actor » Actress » Bollywood » India » Movie » News » Picture » Song » Update » Digital Radio Mondiale at IBC 2018: ?DRM Drives Forward? Digital Radio Mondiale at IBC 2018: ?DRM Drives Forward? Digital Radio Mondiale (DRM) is gearing up for an exciting presence and new announcements at this year's International Broadcasting Convention (IBC) in Amsterdam 14th—19th September. IBC is the leading global tradeshow for broadcasters and media professionals and attracts over 1700 exhibitors from all over the world. Under the overarching theme "DRM Drives Forward" the DRM Consortium has arranged a series of events aimed at giving a full picture of the many DRM global developments that have taken place in the last 12 months, with relevant announcements for the future. 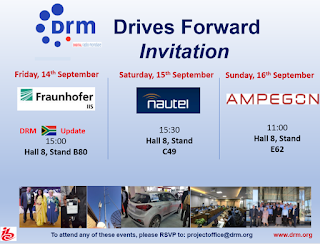 At all DRM events participants will be able to receive the latest updates on market developments in India and the rest of Asia, Africa, Europe and attend demonstrations of all the latest and this time also new DRM broadcast equipment and receivers. The DRM series will be kicked-off with an exciting event hosted by Fraunhofer IIS. This event will focus on one African country and how DRM can deliver for a lot of large countries with diverse communities and needs. A good opportunity to bring you some breaking and exciting news from India, too. 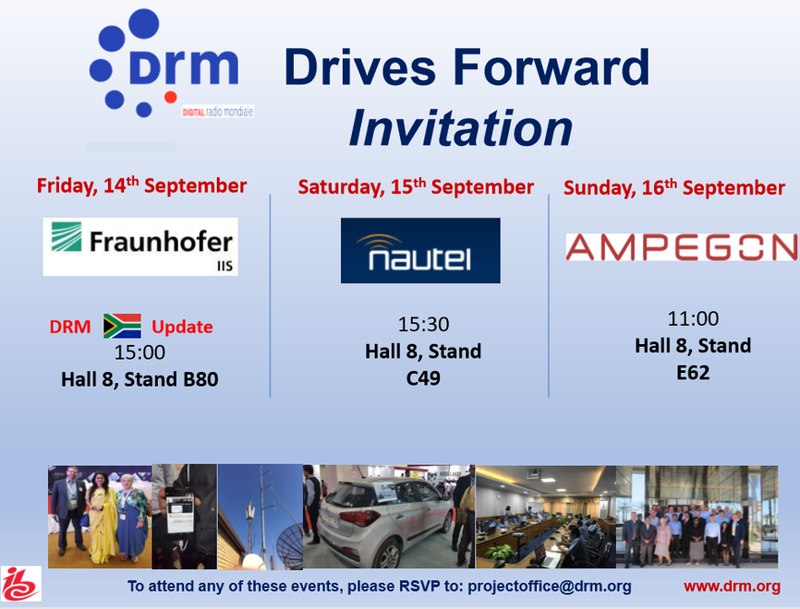 All those interested are invited to meet DRM experts, broadcasters and manufacturers: Fraunhofer IIS and several members of the DRM Consortium on Friday 14th September (Hall 8 B80 from 1500 to 1630), Nautel on September the 15th between 1530 and 1700 (Hall 8 C49). And Sunday 16th September Ampegon is inviting all those interested to a special event from 1100 to 1300 (Hall 8 E62). Ruxandra Obreja, the Consortium Chairman, says that: "The Consortium members want to give those attending a concise view of DRM across the globe and discuss, based on real experiences, the practical ways of implementing DRM. New broadcast and receiver equipment on display will give everyone interested in the digital future of radio the confidence that DRM can be used now to deliver full country coverage and enhanced services to all listeners. DRM makes possible an immediate digital future for all broadcasters large or small, offering more programme choice to listeners, extra multimedia services, emergency warning functionality with increased energy savings and spectrum efficiency."